Riding the Waves. Massive Wave. The sense: more than just in the flow. The sense: being a wave rider, knowing I can do it, can ride the wave. Riding the Waves. 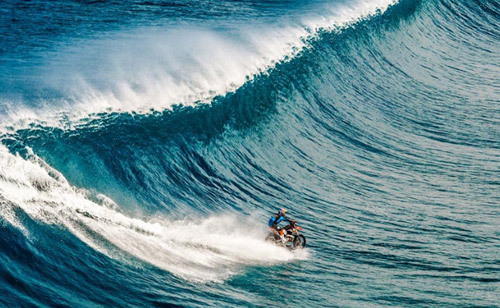 Massive Wave. The sense: more than just in the flow. we can do it, can ride the wave. A few days ago, I wrote about having a "dark night" about the dead boy whose image was used to guilt the West even more - even though the whole story was a lie. I have a different image for you today, one I've kept coming back to. It's of a "wave rider" - someone riding the big waves. On really good days (there not so many of them these days!! ), I sometimes feel like that rider - yes, what we're dealing with is huge, but yes, we can handle it. That wave sometimes towers - as currently with the mass incoming of Islamics into the West - and with most Western countries enabling the influx. According to Heidi Mund, German prayer activist, on one recent day in just one German city, Munich, 34,000 Islamics arrived. And Saudi Arabia, to the best of my knowledge, with its doors firmly closed to Islamic refugees, has announced that it will fund the building of 200 more mosques in Germany. Another wave - memories from 9/11. But there are those amazing days too. So a couple of days ago I had an idea of how to contribute to Heidi's event, and had the sense of, once more, at least for a moment, riding the waves. more than just in the flow.